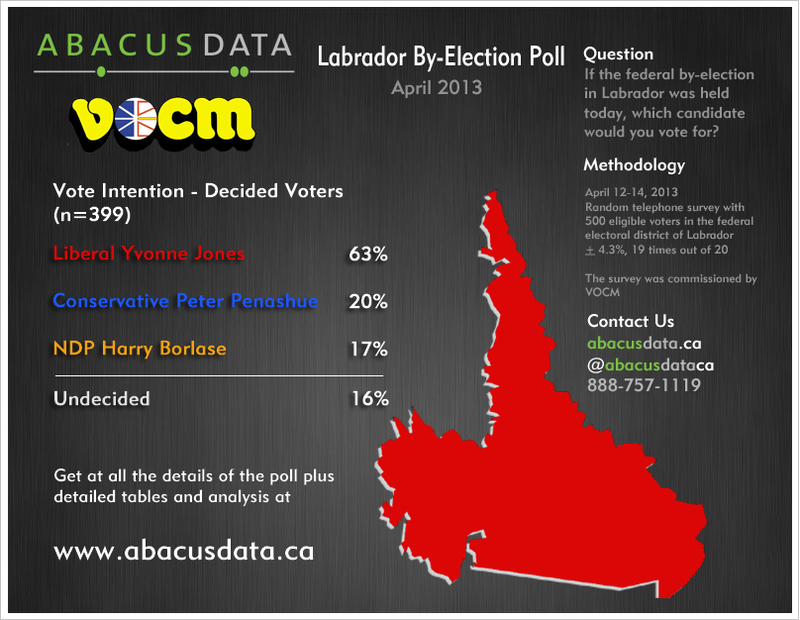 A new survey of eligible voters in Labrador by VOCM and polling firm Abacus Data finds that if the by-election in Labrador was held at the time of the survey, Yvonne Jones, the federal Liberal candidate, would easily win over Conservative candidate Peter Penashue and NDP candidate Harry Borlase. Ms. Jones and the Liberals have the support of 63% of decided voters compared with 20% for incumbent Conservative Peter Penashue and 17% for NDP challenger Harry Borlase. Sixteen percent of all respondents said they were undecided after asking if they were leaning towards a party. The survey finds that Yvonne Jones leads in all regions of the constituency, among men and women, and among all age groups. The Liberal candidate also benefits from her ability to attract voters who supported the Conservative Party and NDP in the 2011 federal election. Among those who voted for incumbent Peter Penashue in 2011, 45% say they will vote again for the incumbent MP while 41% say they will vote for the Liberal candidate. Among 2011 NDP supporters, a majority (56%) say they will vote for Liberal Yvonne Jones instead of NDP candidate Harry Borlase. “This by-election is looking far more like the 2008 federal election in Labrador than the one that elected Peter Penashue and the Conservatives in May 2011,” added Coletto. The survey also asked respondents whether they would consider or not consider voting for the three parties in the Labrador by-election. Six in ten eligible voters (60%) in Labrador said they would consider voting Liberal compared to 44% who would consider voting NDP and 29% who said they would consider voting Conservative. Vote Drivers: Delivery for Labrador, Ethics, or EI Reform? Respondents were asked which of three factors is most important in determining how they would vote in the byelection. Overall, 50% of respondents said “who can best deliver federal government investment in Labrador” was most important, followed by “the federal government’s changes to EI and cutting search and rescue services” (31%), and “Peter Penashue’s ethics problems” (18%). The table above reports vote intention by response to which issue is most important to determining how they will vote. Among those who identified delivering for Labrador as the more important issue in determining how a respondent would vote, only 27% said they would vote for the Conservative Peter Penashue. Has Penashue Delivered for Labrador? Respondents were then asked whether they agree or disagree that Peter Penashue has delivered investment and jobs for Labrador. Almost all of those who strongly agreed (77%) that Mr. Penashue has delivered investment and jobs for Labrador said they would vote Conservative. Conservative support was lower among those who mostly agreed that Mr. Penashue had delivered (40%). “Mr. Penashue has been basing his reelection pitch on what he has delivered for Labrador. While there is a relationship between voting behaviour and perceptions about Mr. Penashue’s performance delivering for Labrador, there are not enough voters who agree with that message to deliver victory for the Conservatives,” said Coletto. Finally, respondents were asked whether they agree or disagree that Labrador is better served by having an MP from the governing party. Overall, a majority of respondents (60%) either strongly (29%) or mostly agreed (31%) while 35% disagreed with the statement. Those who voted Conservative in 2011 (80%) were most likely to agree with the statement. However, despite this view, only a slight plurality of those who agreed (49%) said they will not vote for the candidate representing the governing party. Unless something truly unexpected and exceptional happens between now and election day, the Liberals will pick up Labrador and the Tories will lose their only seat in Newfoundland and Labrador. Only 28% of eligible voters in Labrador said they would consider voting Conservative, over ten points lower than the percentage of the vote Mr. Penashue received in the 2011 federal election. To win, Mr. Penashue has to first convince more voters that he deserves their consideration and then he has to convert them into actual voters. With less than a month to election day and an ethics cloud hanging over his head, that’s a pretty tough road to hoe for Mr Penashue. Labrador voters want someone who delivers for Labrador and they see the benefit of electing an MP from the governing the party. Despite this, over six in ten are planning to vote for Liberal candidate Yvonne Jones. Nationally, these results indicate that newly elected Liberal leader Justin Trudeau will likely have a win and a new MP in short order adding the Liberal momentum we have seen in recent national polls. The random live-interview telephone survey commissioned by VOCM was conducted with 500 eligible voters living in the federal electoral district of Labrador. The survey was completed from April 10 to 12, 2013. The margin of error for a probability-based random sample of 500 respondents using a probability sample is +/- 4.3%, 19 times out of 20. The data was statistically weighted according to census data to ensure that the sample matched Labrador’s population. The tables within this report detail the weighted and unweighted counts for the sample.